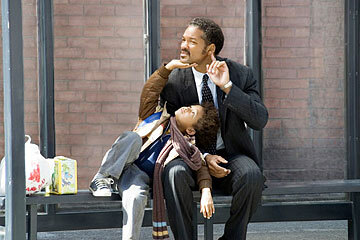 Will Smith and his real-life son, Jaden Christopher Syre Smith, star in "Pursuit of Happyness." The Hawaiian Environmental Alliance is hosting a benefit event Thursday, featuring performances by John Osorio, members of Kupa'aina and Makana. The event, from 5 to 9 p.m., will be held at Sunset Grill at Restaurant Row. Cost is $30 ($18 tax deductible), which includes two drinks and pupus. Call 524-8220 or e-mail kaheainfo@kahea.org. Nominations are being accepted for the 2006 Cades Award for Literature, the state's highest literary honor. Awards will be given to an established artist with a large body of work related to Hawaii; and to an up-and-coming artist with potential for achievement. Nominees may be poets, playwrights, novelists, essayists or others in the field of literary arts. Previous winners are ineligible. Nominations and supporting material are due by Jan. 31 to Cades Award, Hawai'i Literary Arts Council, P.O. Box 11213, Honolulu 96828. Call 263-5627. The Cades Award was created by Charlotte and J. Russell Cades in memory of Russell Cades' brother, Elliot, a teacher and lover of literature. The Honolulu Boy Choir is in expansion mode, hoping to grow to 75 to 80 members by next fall. Recruitment for the spring season is under way. Boys ages 6-1/2 to 12 are invited to a six-session choir class to try out the choir experience. Classes run from 4 to 5:30 p.m. on Mondays and Wednesdays, Jan. 8-24, at Makiki Christian Church. Classes will be led by Pamela DeBoard, the boy choir's choral director, who will introduce singing and performance techniques, reading notes and how to prepare for an audition. Call executive director Jeff Cunningham, 596-SING (596-7464) or e-mail honoluluboychoir@hotmail.com. For more on the boy choir, visit www.honoluluboychoir.org. A performance by Jim Nabors of "The Impossible Dream" will cap a benefit dinner for the USS Missouri Memorial on Jan. 19. Local musicians including Jimmy Borges, Danny Kaleikini, Karen Keawehawaii, Cathy Foy and Emma Veary will join Nabors to perform at the fundraiser, from 5:30 to 9 p.m. at the Hilton Hawaiian Village. The event -- "A Night of American Heroes" -- will honor Nabors and U.S. Sen. Daniel K. Inouye. Each year, the event recognizes individuals who represent American heroism and values. Tickets are $150; table sponsorships are $3,000, $5,000 and $10,000. Proceeds will benefit the restoration, maintenance and operation of the Missouri. Call 423-0607 or e-mail development@ussmissouri.org.